The purpose of recording your name is to provide an audio sample for the readers to use to practice the correct pronunciation of you name. View the on-campus kiosk schedule below. Do it yourself by clicking the "ON-LINE" button following the instructions. Click the "ON CAMPUS" button to find out locations on campus for recording your name. 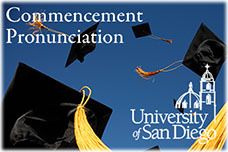 Students should upload their mp3 file no later than Thursday, May 23, 2019 to allow readers enough time to review files before Commencement weekend..
All equipment and software will be provided to you. An assistant will be on hand to take you through the process. Please Note: Be sure to record your name by 7pm on Thursday, May 23, 2019, which is the last available day to record your name. You need to provide your Student ID Card or MySandiego Mobile App. There is no need to make a reservation, but understand that the recording location will become more crowded as the ceremony date approaches.